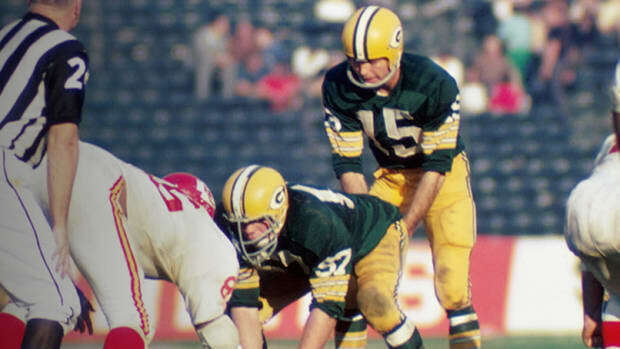 When NFL players took a knee and locked arms this weekend, it wasn't the first time athletes have taken a stand on issues of racial injustice. Younger’s emotional response was widely shared this past weekend, though for largely different reasons. Our national anthem—that sacred yet unloved, notoriously difficult-to-sing standard—has become the bloody hill upon which the latest round of American culture wars are being fought. Setting aside for a moment the question of freedom of speech, the enduring controversy around the anthem speaks to the NFL’s unique position. 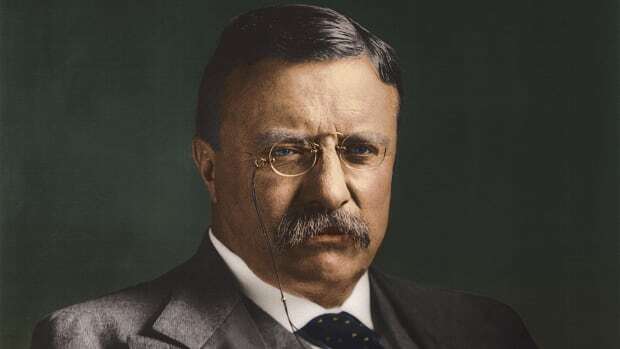 It is perhaps the one institution in America today where such a multi-faceted debate—encompassing entertainment and politics, military service and race relations, free speech and patriotism—could resonate so broadly. The 21 black players, after meeting among themselves to discuss their experience, voted to boycott the game. Some white players, like future Hall of Famer Ron Mix of the San Diego Chargers, joined in. A day later, the AFL owners chose to support their players, and moved the game from New Orleans to Houston. It marked one of the first instances of professional athletes working together to make a social statement. During much of the ’70s and ’80s, pro football players spent more time advocating for their own rights, finally achieving a system of free agency in 1992, nearly two decades after Major League Baseball players gained the right. 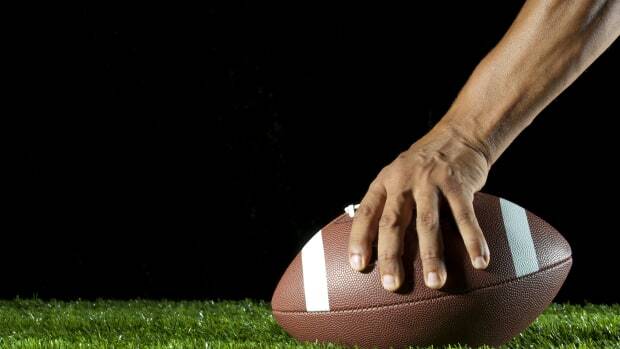 More recently, players have returned to a focus on broader social issues. 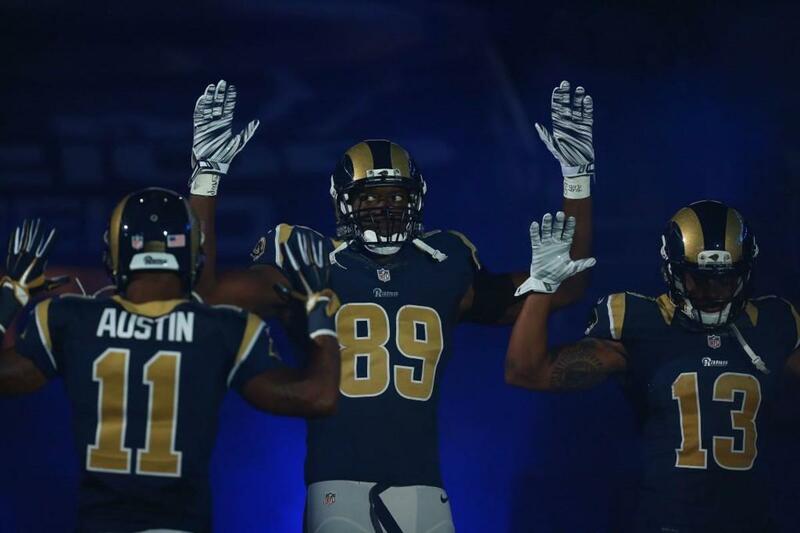 In 2014, a group of St. Louis Rams players took the field in a “hands up, don’t shoot” gesture, in a sign of solidarity with the Black Lives Matter protests in Ferguson, Missouri, in the aftermath of the shooting of Michael Brown. Kevin Demoff, the Rams executive vice president of football operations, defended the players’ action. “I do believe that supporting our players’ First Amendment rights and supporting local law enforcement are not mutually exclusive,” he said. In 2015, the University of Missouri football team threatened to boycott games and practices to protest school president Tim Wolfe’s handling of issues involving race relations on campus. Two days later, Wolfe resigned. “The Star-Spangled Banner” has always had its share of detractors, both as a song and as a statement. Despite his crucial role as a trailblazer in race relations in America, the Dodgers’ Jackie Robinson took the measure of the country in 1972 and remained resolutely unmoved by the song. 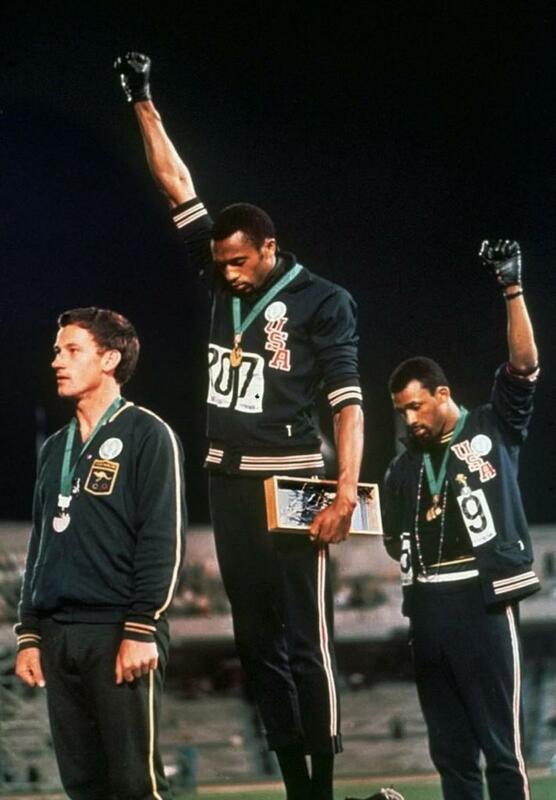 (“I cannot stand and sing the anthem,” he wrote in his autobiography, “I cannot salute the flag.”) At the 1968 Olympics in Mexico City, Americans Tommie Smith and John Carlos each held up a single gloved fist in protest during the medal ceremony after the 200 meter sprint. Even in the NFL, Kaepernick wasn’t the first player to decline to stand for the anthem. 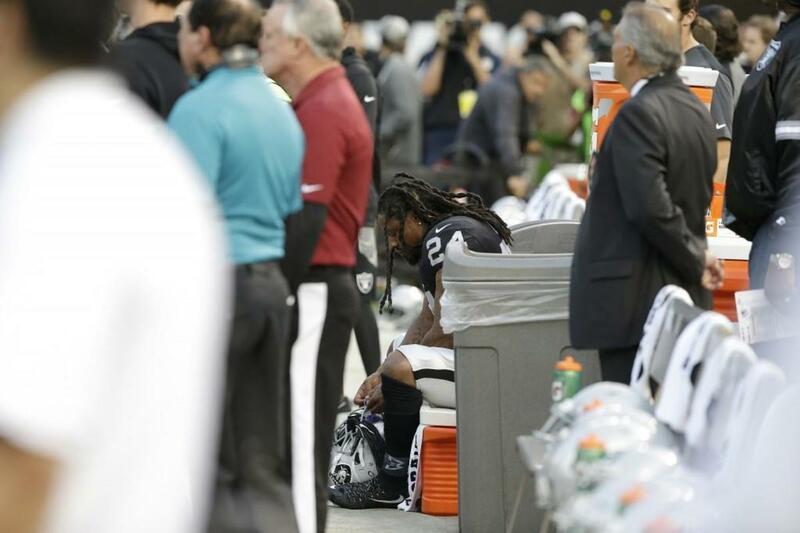 The Raiders’ Marshawn Lynch often sat on the bench during his years with the Seahawks, and continues to do so. But the visibility of Kaepernick (as well as his protest occurring during the heated political climate that was the fall of 2016) brought the issue to the forefront. 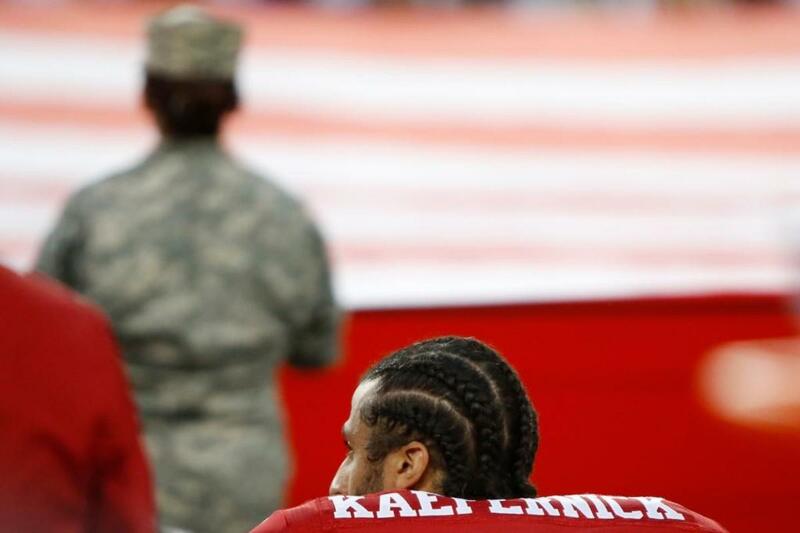 Less discussed is the way Kaepernick’s protest evolved, as he and others took pains to find a way to bring about change while emphasizing that they were not disrespecting those who served and defended the country. At the beginning of the 2016 preseason, Kaepernick sat on the bench, away from his teammates, during the anthem. But in San Diego, on the eve of their final pre-season game, Kaepernick and 49ers teammate Eric Reid met with former Army Green Beret Nate Boyer, who’d had a brief tryout with an NFL team in 2015. 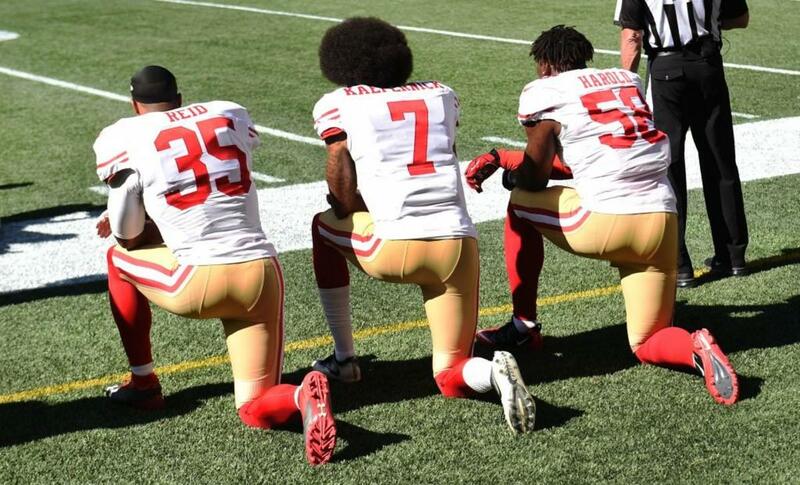 After the meeting, Kaepernick modified his protest from one of sitting on the bench to kneeling near his teammates. In that act—seeking out a position somewhere between defiantly ignoring the flag and standing to salute it—Kaepernick seemed to be searching for a middle-ground of protest that wasn’t automatically seen as disrespectful. In the wake of Trump’s comments and tweets over the weekend, some players sat on benches during the anthem, while many more followed Kaepernick’s lead and kneeled, some with their hands placed over their hearts. Others who didn’t kneel chose to stand while holding hands or interlocking arms with teammates who were kneeling. 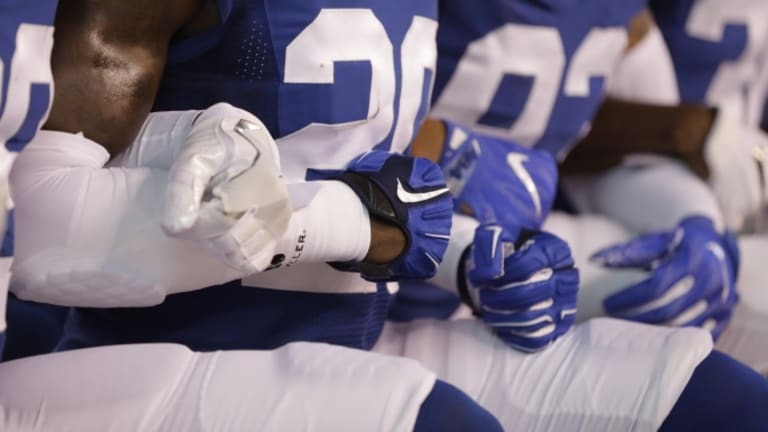 The distinction that many protesting players wanted to make was that they could respect the military, while still wanting to call attention to the issue of racial injustice. The impetus for their collective action: the inflammatory remarks of President Trump, who has a history of being snubbed by the NFL, one exclusive private club to which he was never able to gain entry. In seeking unity, teams have to cut through a lot. 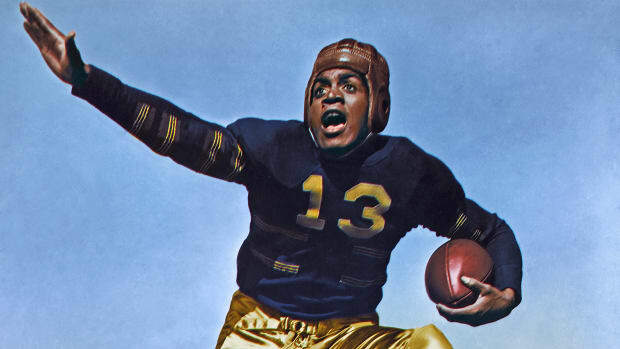 Football remains an authentic American melting pot, arguably the most socially diverse of American team sports. 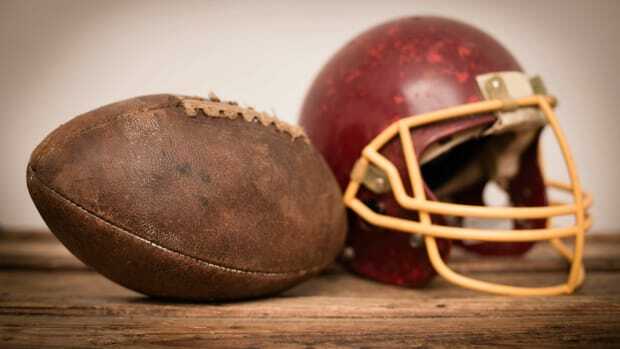 There’s black and white, urban and rural, conservative and liberal, country and rap, even cultural differences by position—offensive linemen tend to be more bookish, wide receivers more demonstrative—all in the same locker room. Inadvertently, Trump’s criticism served to draw football players closer together, sharpen the terms of their protest and give them a platform to clarify it. The way they responded—emphasizing that while they were not all the same, they were decidedly all together—speaks to an ideal that is as enduring as the anthem itself. By finding unity despite their disagreements, the players may well end up providing a lesson for the nation as a whole. 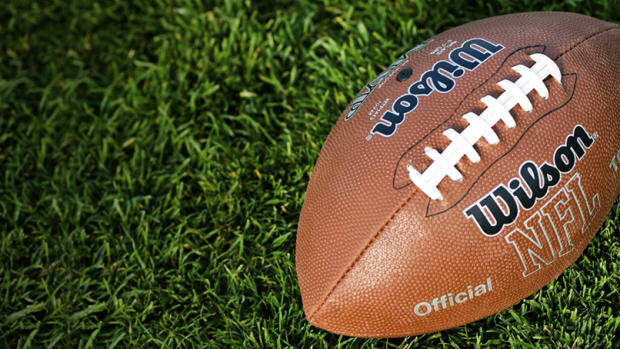 Michael MacCambridge is the author of Chuck Noll: His Life’s Work and America’s Game: The Epic Story of How Pro Football Captured A Nation, among other books. Reach out on Twitter at @MacCambridge.